The theme for last year’s company retreat was “how can we grow personally and professionally as the company grows?” We came away from those two days brimming with ideas and in the six months that have passed, lots of new things have been put in place. I was definitely able to learn and develop as dxw digital grew in 2018. 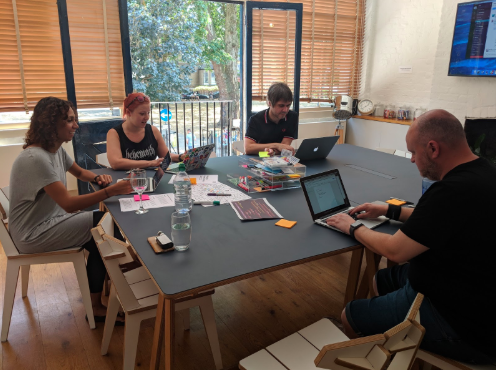 My transition from user research into a new service designer role is testament to this, and I’m writing this blog post to share a bit about that experience. I hope it shows how careers can grow at dxw digital, as well as highlighting the things that have been most helpful for me. One of the reasons I was drawn to dxw digital when I joined in 2017 was because it was an SME. Having previously worked in very large organisations, I hoped that the change would mean it was somewhere everyone could contribute ideas and help shape the direction of the company. I wasn’t disappointed and have found that there are lots of ways to bring new ideas to the table. Not only have I felt like I’ve had a voice, but I’ve found that different ideas and perspectives are welcome. I’ve really appreciated and made the most of the structures we have in place for doing this. These include retros, internal ‘Friday’ projects, the annual retreat, and team meetings. One of the retreat actions was to create a cross-discipline design community, and I’ve really enjoyed helping to set this up. There’s also opportunity to make use of less formal channels of communication – 1:2:1s, an open door policy and the general openness of the leadership team. As designers and agile practitioners, we have an experimental mindset. We try things out in small-scale tests, fail fast and learn quickly. And the same approach can be successfully applied to other areas like growing careers, teams and organisations. So as well as raising new ideas, I’ve had the opportunity and freedom to try things out. Whenever I’ve suggested things we might try I’ve always found I’ve had the support of the team to give it a go. 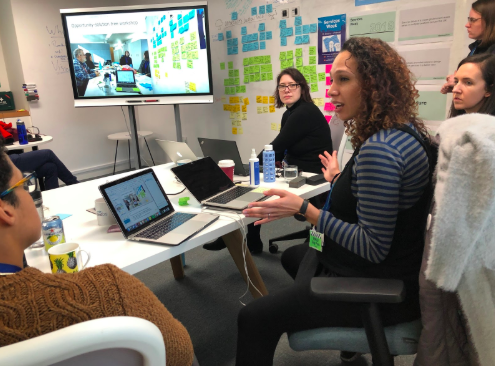 As a result, we’ve trialled lots of service design tools and methods that weren’t previously part of our standard practice, things like user story mapping, How Might We sessions, value proposition design, opportunity-solution trees and Realtimeboard. As a team, we learn continuously from these experiments, assessing what works well for us and our clients and what not so well. It’s a great feeling when an idea you’ve tested works and becomes part of the way we work. Since joining I’ve also taken on new roles and responsibilities on project work. At the start of 2018 I moved from user research into a service designer role on the Teaching Vacancies Service beta for the Department for Education. Before this, dxw digital wouldn’t normally provide a service designer role in delivery teams. But after conversations with leadership and the client, we decided it could add real value to a large project like this and help ensure that our design practice is truly collaborative and grounded in research. I put myself forward for the job and we gave it a go! It was a fantastic experience that gave me a chance to apply a broader range of the skills and experience I’d gained in my career pre-dxw, as well as get my teeth stuck into new challenges. One year on and the feedback on the service design role and capability has been really positive. So much so that I’ve now moved formally into the Service Designer role which sits in the new Strategy team. I’m excited to be involved in building this new capability as dxw continues to grow. My experience at dxw digital has proved that growing your career doesn’t have to be all about formal development frameworks and pathways. In an organisation that values openness and curiosity and has a supportive leadership team, it’s possible to steer your career in new and exciting directions. And even better, by contributing ideas and trying new things you can help to shape the future of the company at the same time. The post Growing with the company and taking on a new role as Service Designer appeared first on dxw digital.